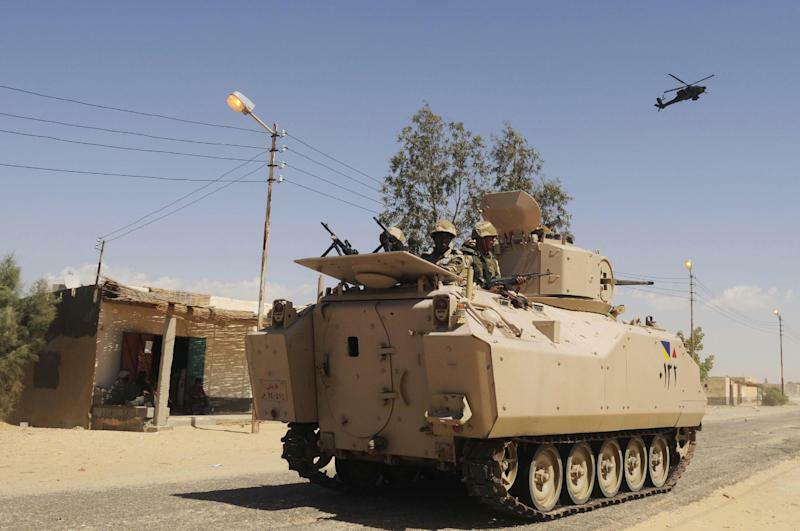 EL-ARISH, Egypt (AP) — Egyptian army troops backed by helicopter gunships attacked hideouts of Islamic militants in Sinai on Tuesday, killing nine and arresting 10, a military official said. The latest raids raised the death toll from four days of operations to 29. Officials have described the military offensive that started Saturday as the biggest sweep of the region in recent years, aiming to weed out al-Qaida-inspired groups who have taken hold in villages in northern Sinai. A military official said militant infrastructures, including weapons caches, missile launchers, and nearly 100 vehicles were targeted in the operation. The official said troops, often with the help of air cover, have also targeted shacks and homes used by militants as hideouts, and areas where they stacked fuel for vehicles. The official says explosives material, weapons and ammunition were found on Monday in the villages of el-Mahdiya and Naga Shabana, south of the town of Rafah near the border with the Palestinian Gaza Strip. The official said that in addition to the militants killed, some 30 were arrested during raids — mostly low level operatives but part of the network nonetheless. One officer and two soldiers have also been killed in the operation since Saturday, according to the official. Over 2,000 soldiers are taking part in the campaign — one of the largest deployments in Sinai in peacetime. The official spoke on condition of anonymity because he was not authorized to speak to the media. Officials say that the military is hunting hundreds of militants believed to be responsible for a series of attacks in a region they overran after the fall of autocrat Hosni Mubarak in 2011. Since the overthrow of his successor, Islamist president Mohammed Morsi, Sinai has witnessed a spike of deadly and near-daily attacks. The militants, the officials say, belong to a number of well-known al-Qaida-inspired groups that seek the establishment of an Islamic Caliphate in northern Sinai, a region bordering Israel and the Gaza Strip. On Monday, state news agency MENA reported unnamed senior security officials as saying at least six militant groups with an estimated 5,000 members operate in Sinai. Militants have used the mountains in north and central Sinai as hideout, where the rugged terrain has proved difficult to search. Repeated security operations have increased tension with local residents, who accuse authorities of randomly targeting homes and arresting innocent people. On Monday, Morsi supporters protested in northern Sinai, blocking a road in Beir el-Abd — a town leading to the provincial capital el-Arish. After the crowd clashed with residents, military troops cleared the road and fired in the air to disperse the crowd. A security official who also spoke on condition of anonymity because he was not authorized to speak to the media, said two pro-Morsi supporters died after sustaining wounds during the shooting.